The Bank of England held Bank Rate 0.50%. The next decision on Bank rate is due on 21 June 2018. Rates were initially expected to rise in May, but market expectations changed with the lower than expected performance of the UK economy based on recent GDP data. This decision appears to be the main driver of the bank rate decision, with the majority of the MPC wishing to see further evidence that momentum is returning to the economy before committing to further rate rises. The Bank of England also downgraded its annual growth forecast for the UK economy to 1.4%, mainly linked to the disappointing first quarter, and impact of the ‘Beast from the East’. The expectation is that the Bank will still seek to raise interest rates later in the year, to bring inflation to target. 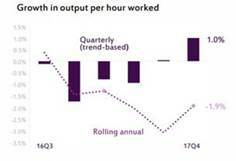 Statistics released this week for Scottish Productivity in Q4 2017 also demonstrated continually falling output per hour annually, with a fall of 1.9% over the year. Although there has been a quarter on quarter increase, discussions with Fraser of Allander suggest that this may be related to the rise in unemployment across part of this period. The output per hour growth rate has slowed significantly from pre-2007 levels, down from an average of 1.5% from 1998-2007, to approximately 0.5% per year currently. SCC met with the Economy, Jobs and Fair Work Committee to discuss more ways to feed into the ongoing work of the committee via our research and consultation responses. We also discussed the Committee’s work on Scotland’s Economic Performance, and the ongoing results of their inquiry into Economic Data and how this is generated and used to inform policy decisions across Government and Industry. The next major enquiry for the Committee is on Business Support and SCC will be coordinating a full written response to this on behalf of the Network.